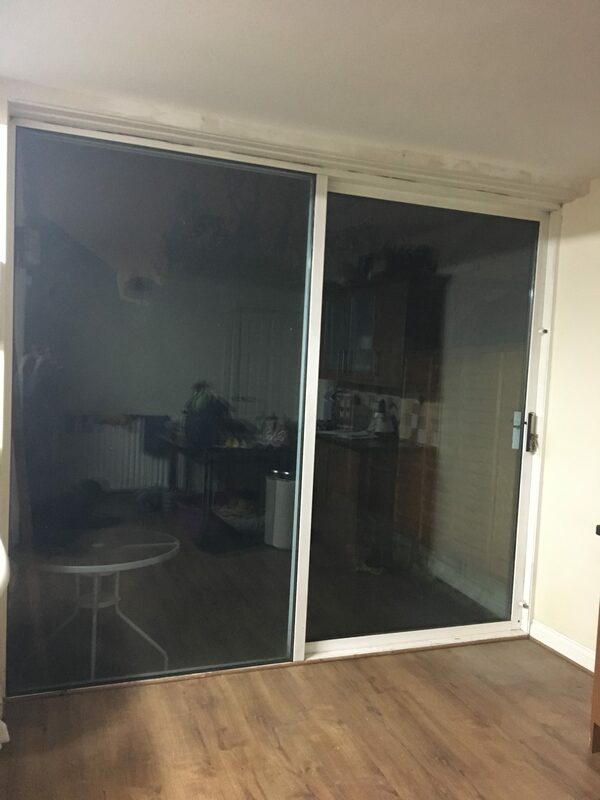 Are you looking for new furniture to create a new room in your house or just update/replace your old stuff that you have fallen out of love with? Look no further than Lionshome You can buy everything you can ever think of for every room in your house even the kitchen sink. It helps you find all your items under one roof and directs you to the place to buy them and takes the stress out of shopping. Lionshome website is really easy to negotiate around giving you clickable links for every room or item you are looking for. Arrrggghhh, this is actually more difficult than I thought as there is so much nice stuff, I want it all in my home. I would love this Table Mexican Pine corona Range unit, it would perfectly in the recess to put our television on and hide all the boxes and electrical in to prevent our little boy from thinking everything is a toy he can play with. It’s currently in the sale for £64.99 too, Bargain. If our lounge was big enough I would love this Stylish Coffee Table With Swivel panels – AVEIRO Walnut and White as we currently have to use the fire place or the gas meter boxing in as a table. I would love some decent and comfy garden furniture this vidaXL Outdoor Lounge Set 15 Pieces Poly Rattan Whitewould be perfect but priced at £568.99 I think it is a little out our budget. A hot tub has always been a favourite of mine and would love a nice decking area to be able to have one so we could go out on an evening once Freddie is in bed with an alcoholic beverage and relax and unwind after a week at work. We have a 3 bed semi detached house but since having our little boy the spare room is full of boxes waiting to go in the loft of all his old toys and clothes. How relaxing would this Leegt Custom Photo Mural 3D Wallpaper Forest White Pigeon Flower Vine Ceiling art be? You could put it in most rooms and it would be sure to take you away to a far away place. Would love Freddie to have a little corner in his room where he can relax and read his books or play with his toys and this Indoor/outdoor bean bag from Little Bertha would be a perfect addition and priced at £19.95 makes it even easier. 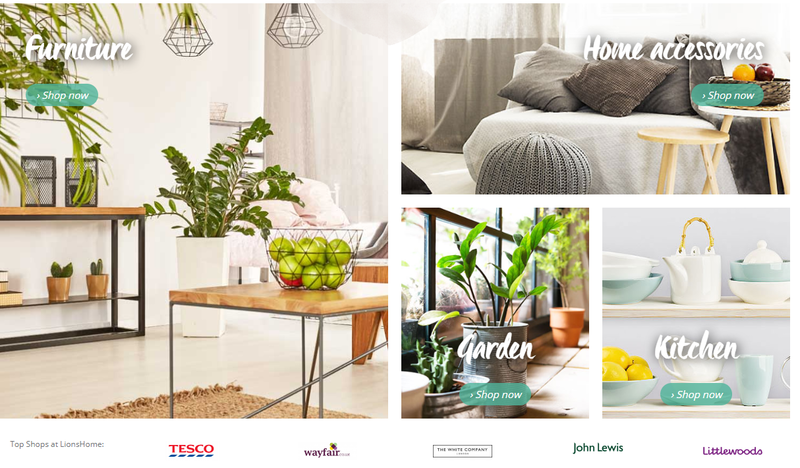 What did we think of the Lionshome website? I love nothing more than adding the final finishing touches to a room that has been freshly decorated or renovated. So once our bathroom had finally been completed this was exactly what I did. Find below what I did. 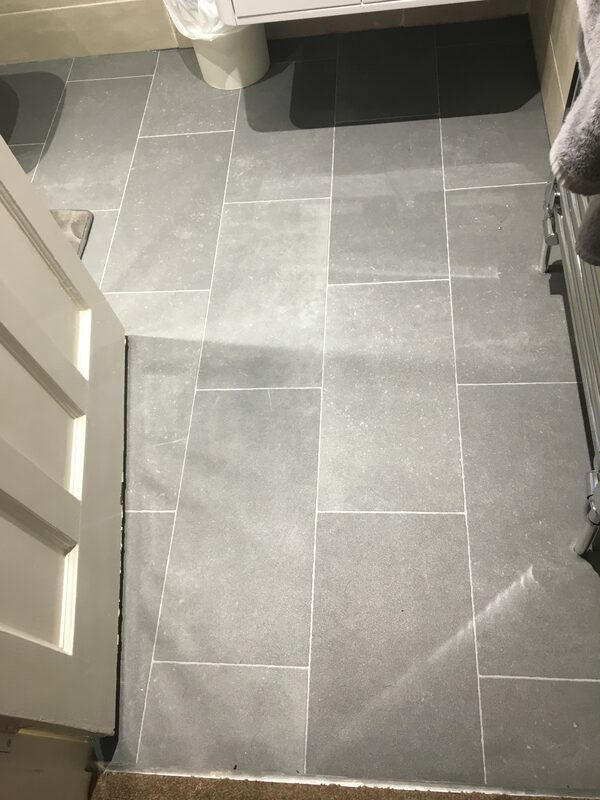 It took us 2 months to finally decide on this flooring, we had been let down by two previous companies, and I walked into Solihull Carpets one Thursday after work to get samples, took them home, we decided that night that we found one. Took the samples back to the shop on Friday, got it order and booked in for fitting the following week and all for just over £100. Great service, highly recommend this company. 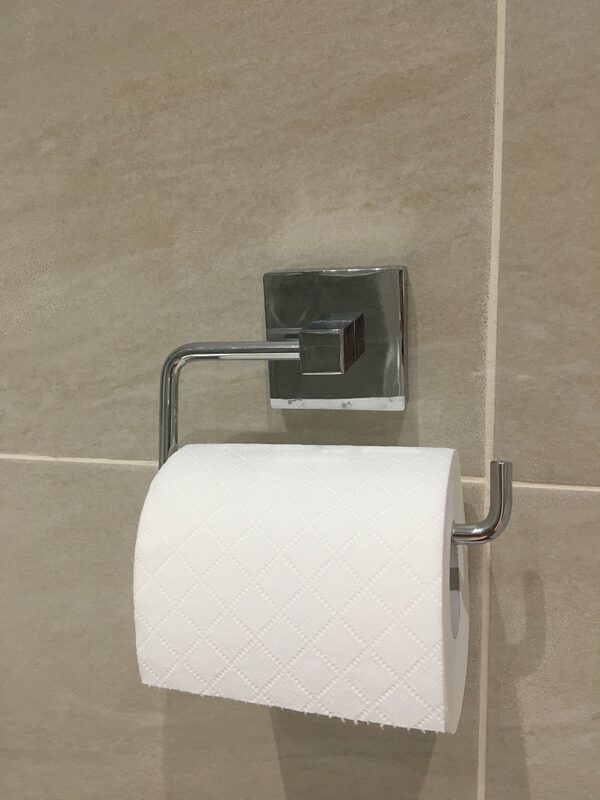 Firstly I knew I wanted brand new fresh fluffy towels for the bathroom, there is nothing wrong with our others one but don’t really go with the new colour scheme in the bathroom. I brought 2 sets one from John Lewis and the other from Marks & Spencers. They were both in the sale so managed to save a few quid too. 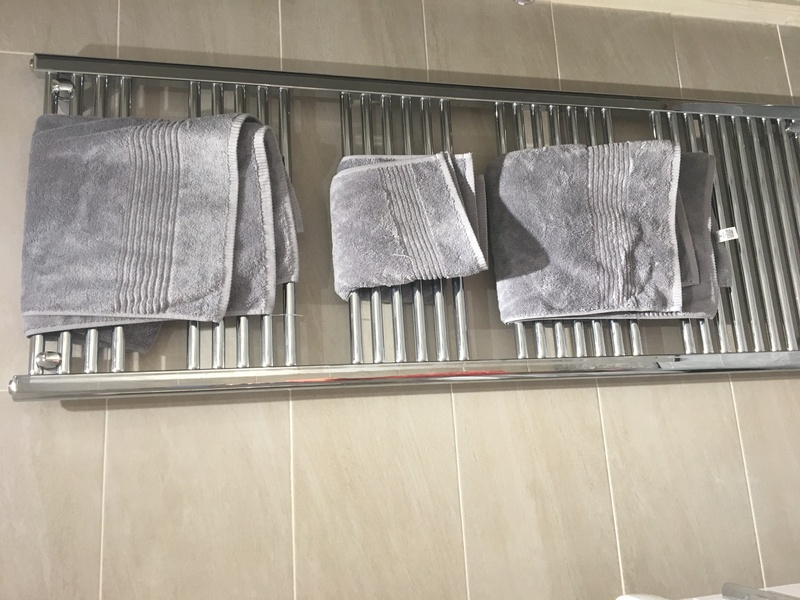 We were gifted the below items from croydex for inclusion in our bathroom refurbishment. This is a memory foam mat and is so warm, soft and fluffy you won’t want to get off it. Will be sure to buy another one of these. 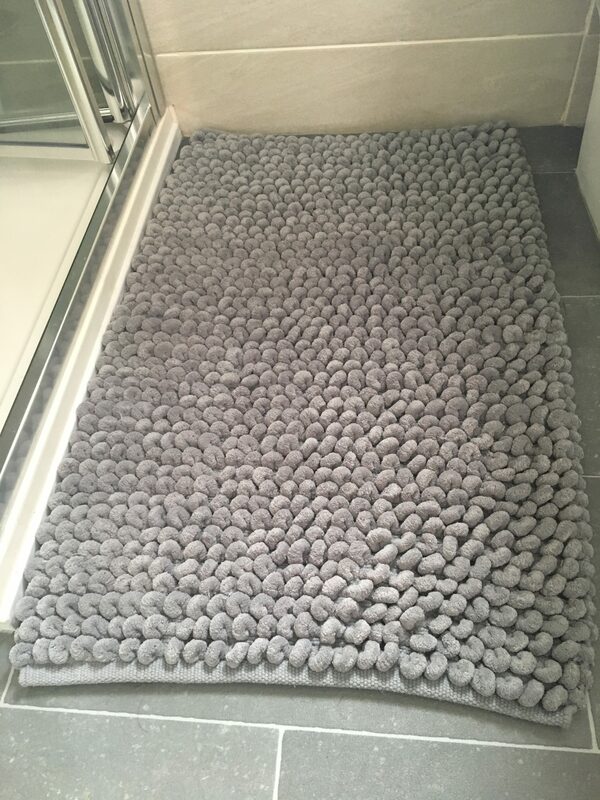 This one is also very soft, they are easy to wash and with them being grey doesn’t show up dirty as easily as other colours might. Now we just have a shower this is needed to wipe down the tiles and scream to prevent smears and water marks, I do it whilst still in the show but after I have turned it off, obviously. 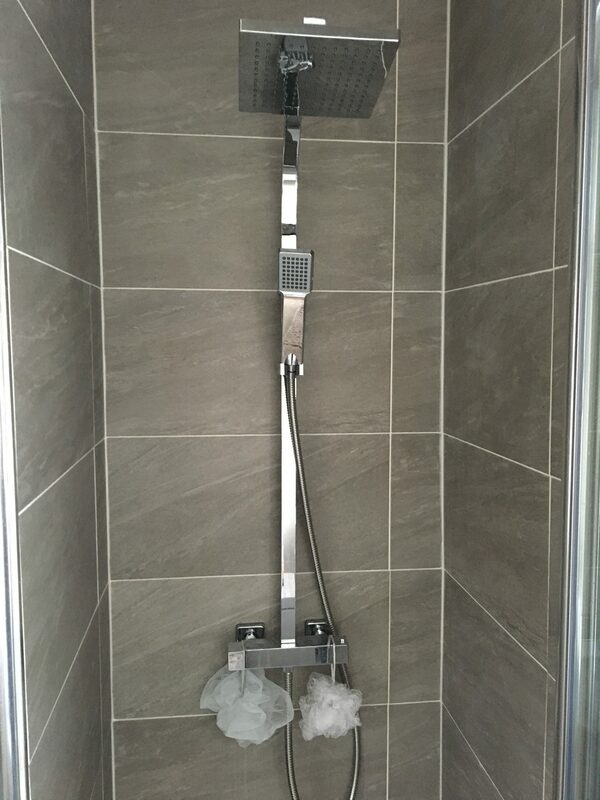 Unfortuantly the one we had chosen has since been discontinued so can’t link to it but it is square which matches the shower, luckily the fitters put it on the wall for us but you can screw it on or glue it on dependant on what you want to do. 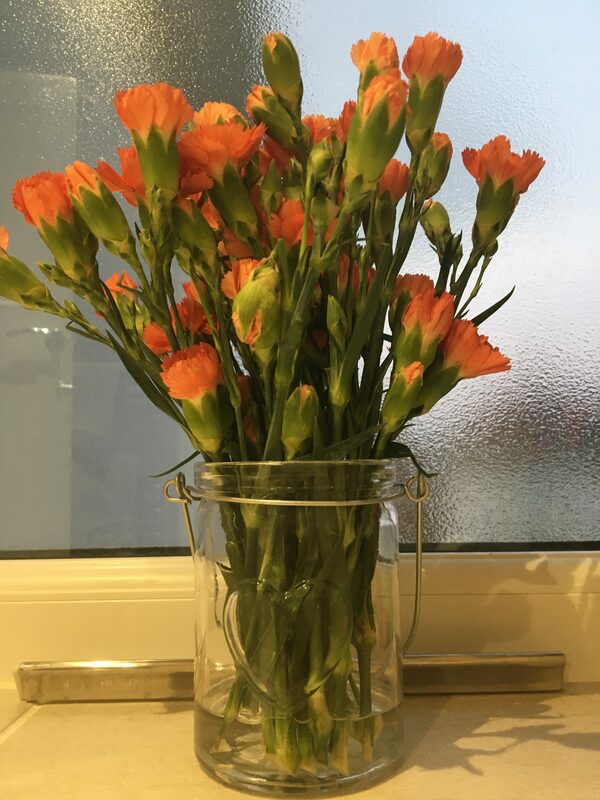 Then finally I saw this one day in sainsburys as I was having a wonder round and fell in love with it and thought it would make a great vase supposed to a candle holder. What finishing touches do you like to add to your newly renovated room? 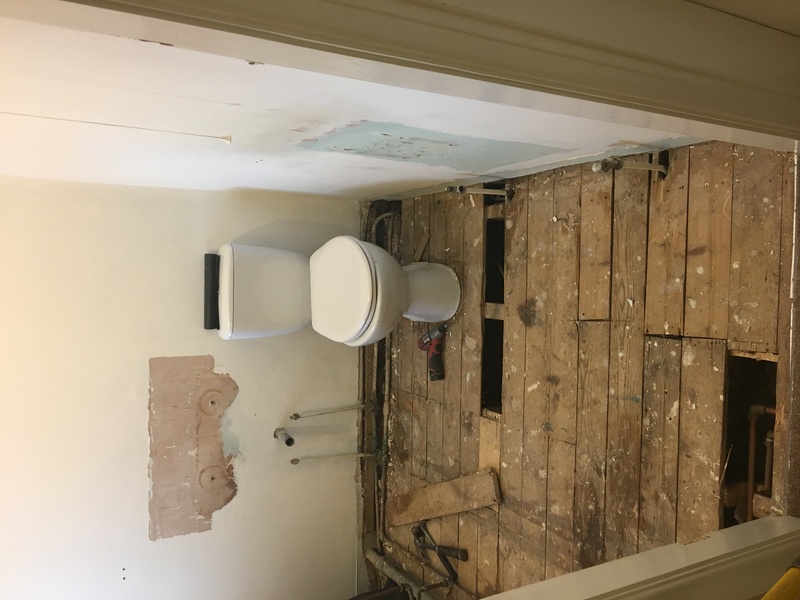 A few months ago we decided to embark on a full bathroom renovation. It’s something we’ve wanted to do since we moved in three years ago but as the old bathroom was pretty functional it was always low on the list of priorities. 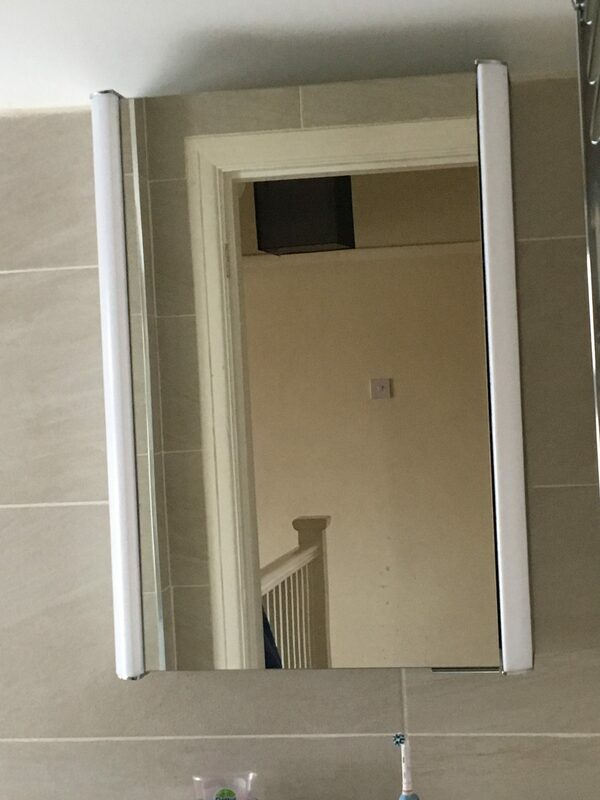 We got all the quotes and prices we needed and it worked out cheaper to buy the bathroom from one company and get it fitted by another, both who were friends of my dads, so we managed to save a few pounds. 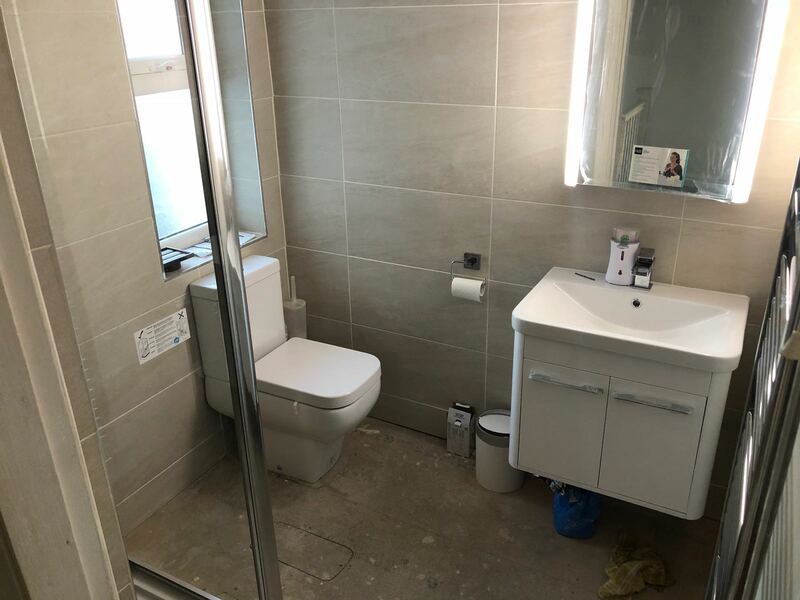 Well finally after 8 long stressful weeks I can finally say it is all complete minus the new flooring as we are still yet to decide on a colour and brand we would like, and want it to be hard-wearing. 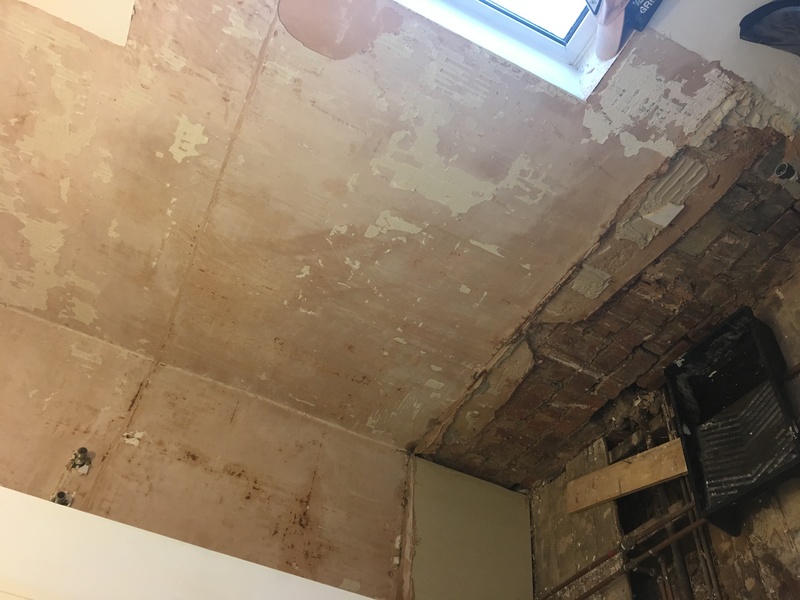 I wrote a couple of weeks ago about the bathroom renovation 5 weeks on. It was great to see the progress made each day but I was so excited to see the finished result. Now it’s complete I thought I would share our bathroom renovation with you. So here it is. 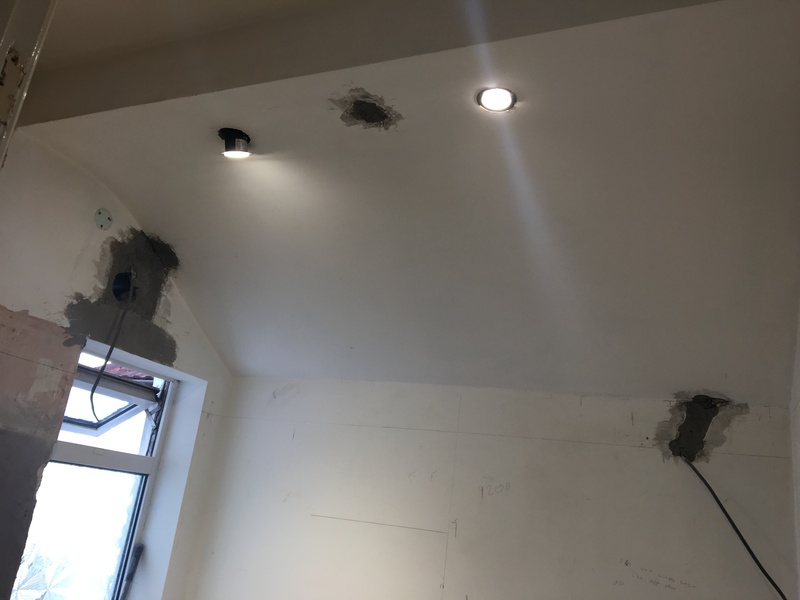 We swapped our ceiling light for spotlights to make it that little bit more modern not to mention they make the room so much brighter. 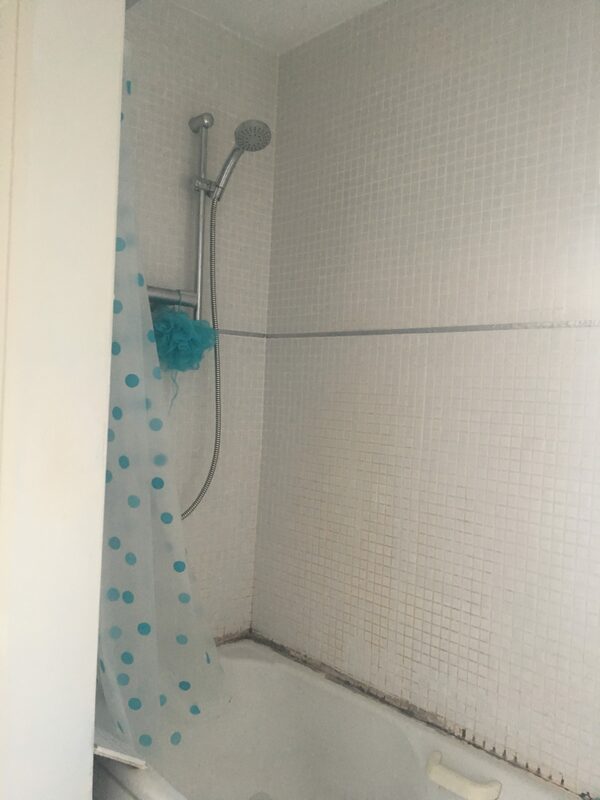 We chose to lose the bath and have a decent power shower with a large square head and a smaller flex hose head to bathe Freddie in the shower while sitting down. 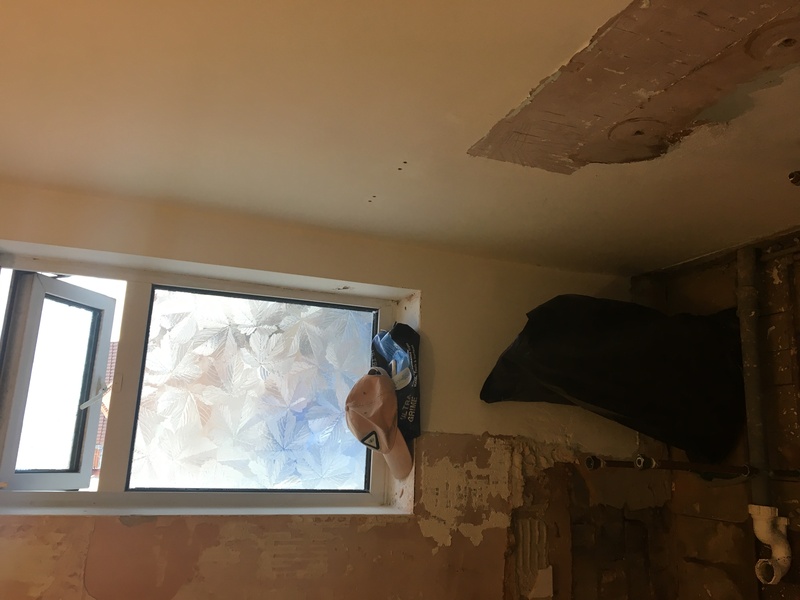 We had real trouble with the shower as it was going where the original shower was, so the wall was studded out to hold the bespoke screen. 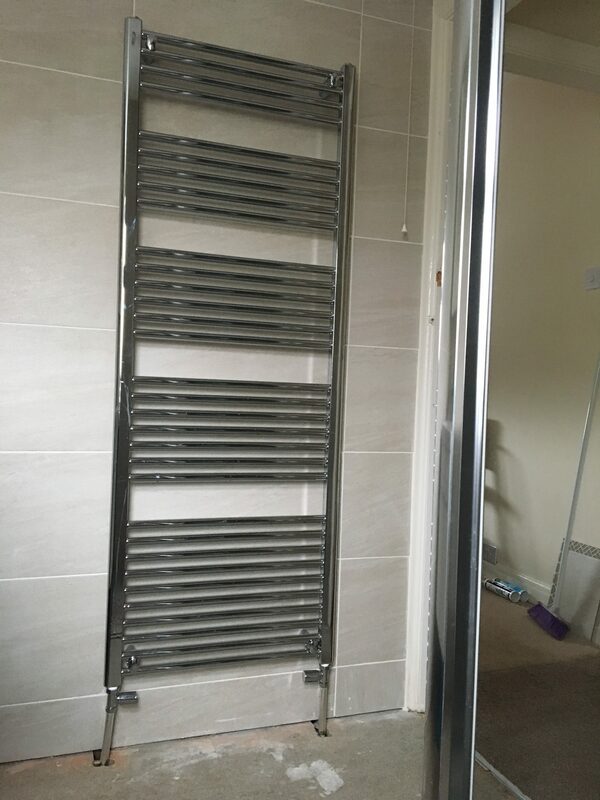 We even opted for a chrome towel rail supposed to a radiator, again something more modern than a radiator that will still give plenty of heat out, but doesn’t stick out. I hated the old radiator always looked dirty with it been painted. Adding a cabinet with light & mirror so my husband can do his hair in the bathroom instead of the bedroom now, and stop messing up my bedside cabinet with all his products. 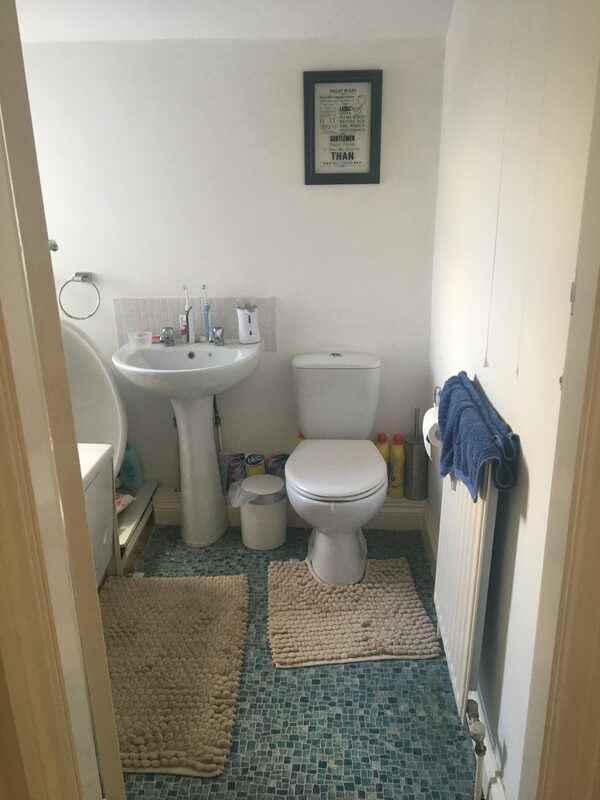 The whole bathroom feels so much bigger now and we are both so pleased with it. A massive thank you to all the guys especially Matt & Phil at P B Hughes. Can’t recommend this company enough. Just the flooring now to decide on then it is onto the next project that I want to start and it’s a big one…The Kitchen. On Sunday night me and Hubby cleared out the bathroom ready for an early start the next day. 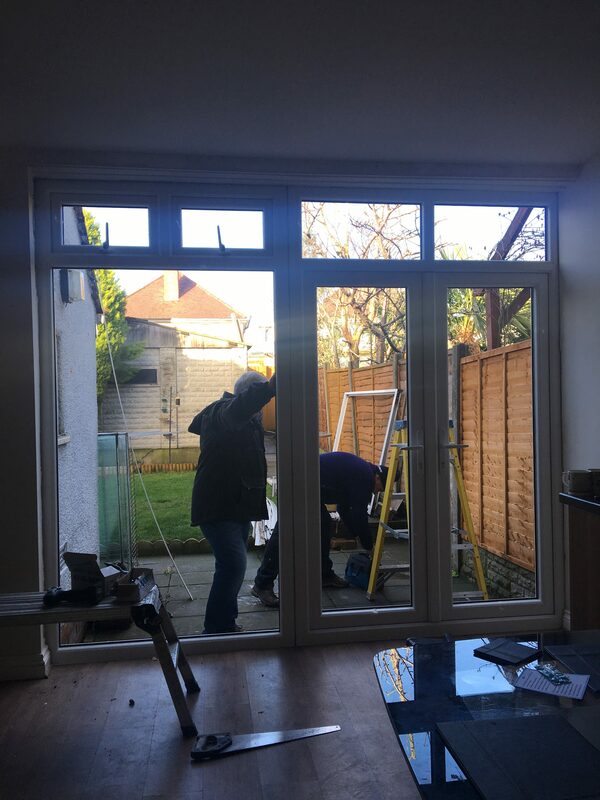 The builders & fitter’s arrived at around 8am-8.30am on the 29th January. 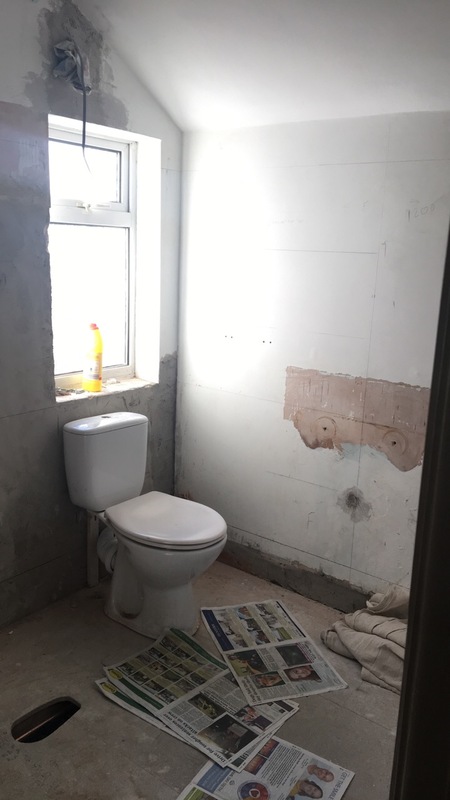 we couldn’t wait to see our new bathroom in a matter of weeks. 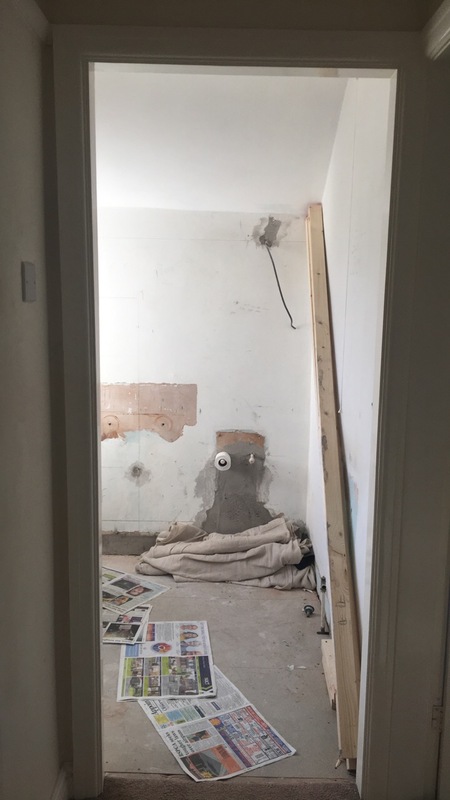 Well, we are now well into week 5 of our bathroom renovation and what a stressful few weeks it has been. 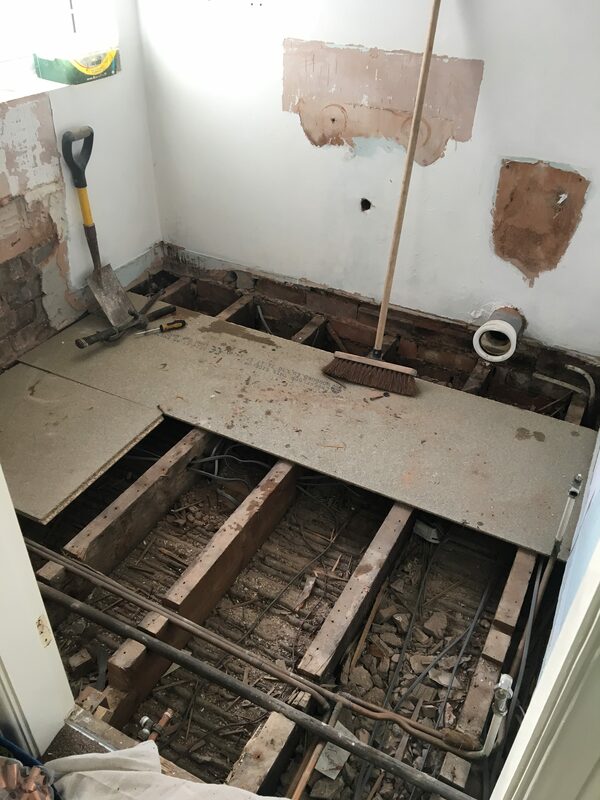 It started off so well, it was stripped out, the floor was taken up to check the pipework to reroute it to make way for the new bathroom layout. Unfortunately it wasn’t that straight forward when they got the floor up. The day started off great, we said goodbye to the old suite and they stripped it out and started removing the tiles off the walls. 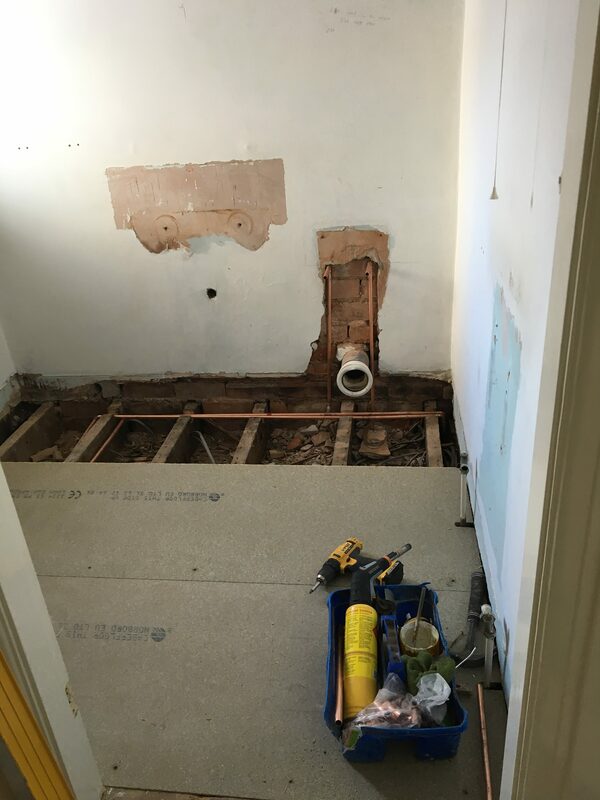 The next plan was to get up the floor boards to chase the pipework and that’s where they discovered an issue. 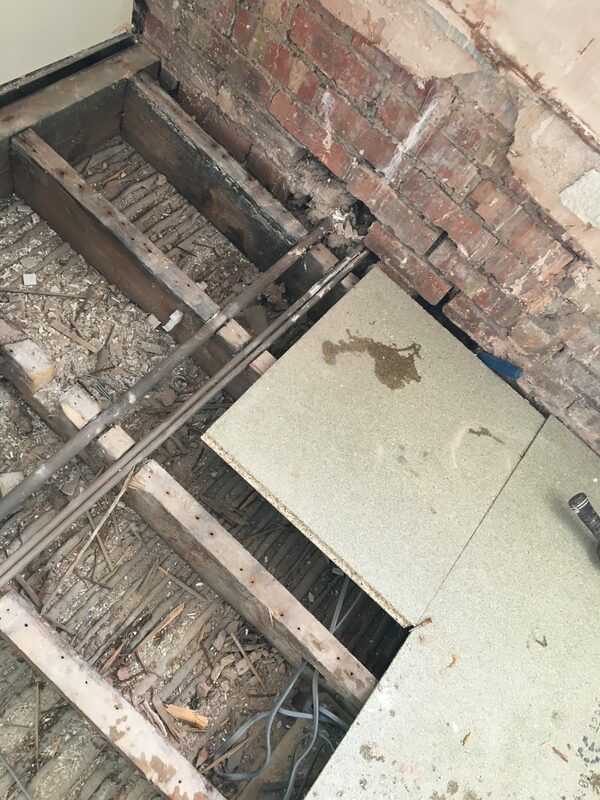 Previous owners had taken massive chunks out of the joists that support the floor. 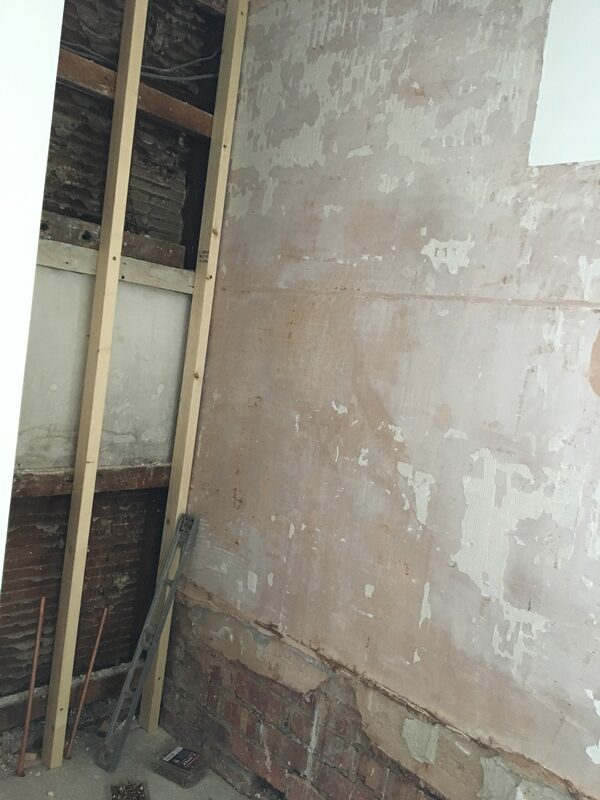 (Look carefully in picture 1) which then delayed the work as they had to pull up all the floorboards to support the joists. We had new spotlight put in, the electrics put in for the mirror light cabinet and for the new extractor fan. Then a new hole was drilled for the repositoned waste pipe for toilet. 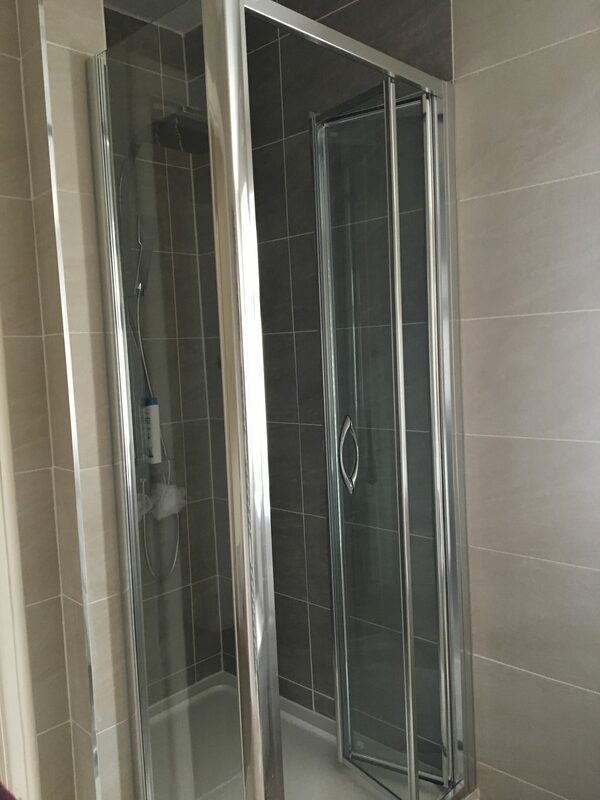 We had a few weeks of no progress due to waiting for our bespoke shower screen to be made and delivered. 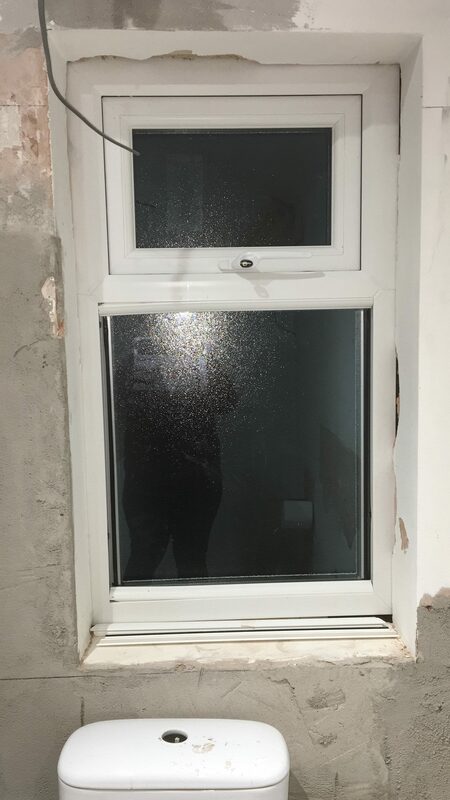 We had the new bathroom window fitted, it’s amazing how different just having a new window makes a room look so much better. 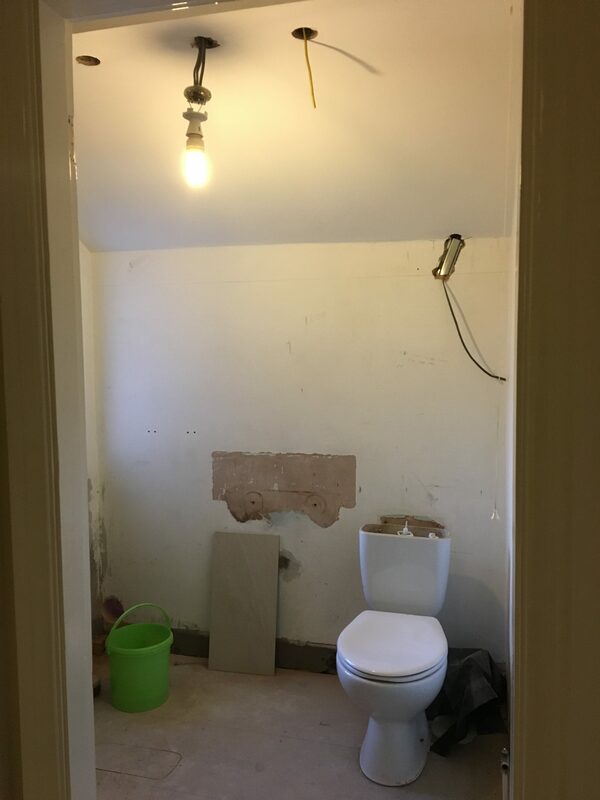 Right well that’s the progress so far, so once it is finished I will publish another progress post for the finally finished renovated bathroom. 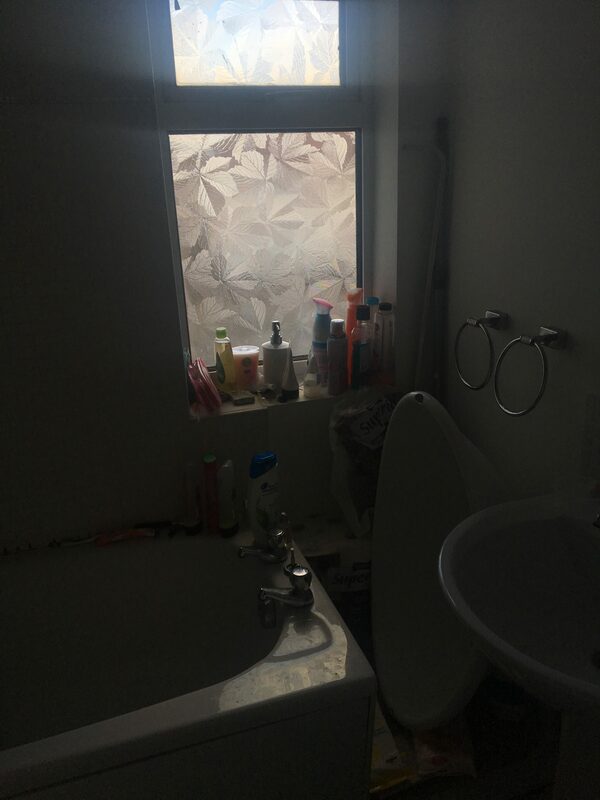 One room in our home that we’ve never fully updated is the bathroom. We gave it a coat of white paint and added a few accessories but apart from that it has never really changed at all. 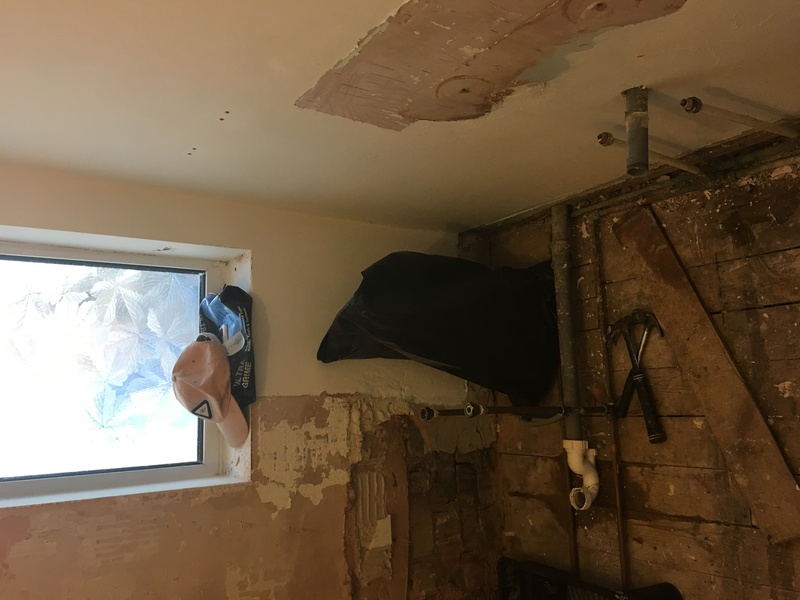 The time has now come though to update the bathroom fully and so during the next few weeks we are having a complete bathroom renovation – something that neither my partner or I have ever lived through before not mentioning with a baby! We have planned it all, have found someone to put it all together for us and now we just can’t wait to get it finished. As you can see it’s pretty grim no matter how much we clean it never looks nice so will be glad of a new one. The lighting is terrible in it aswell so it always looks so dark. 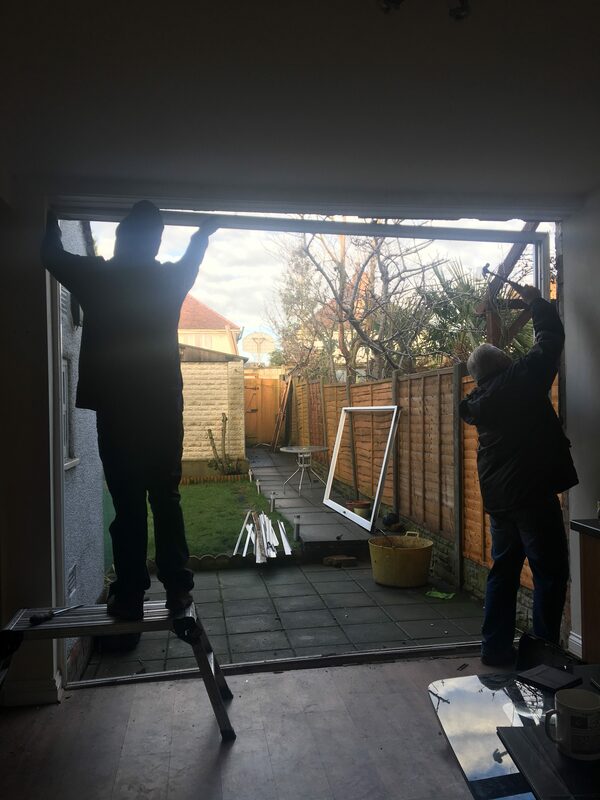 We also decided to have a new window fitted seeing as we are having the rest done. 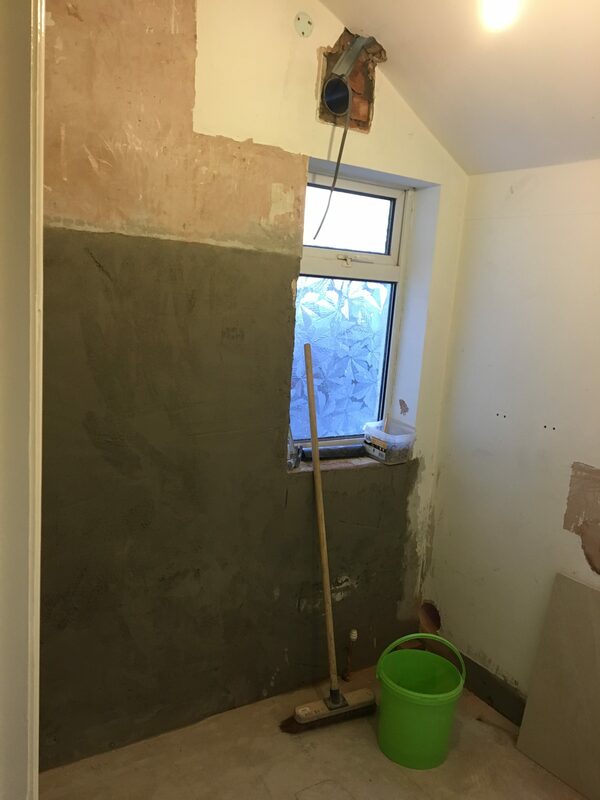 Lastly, we’ll be having fully tiled walls and easy to clean flooring. 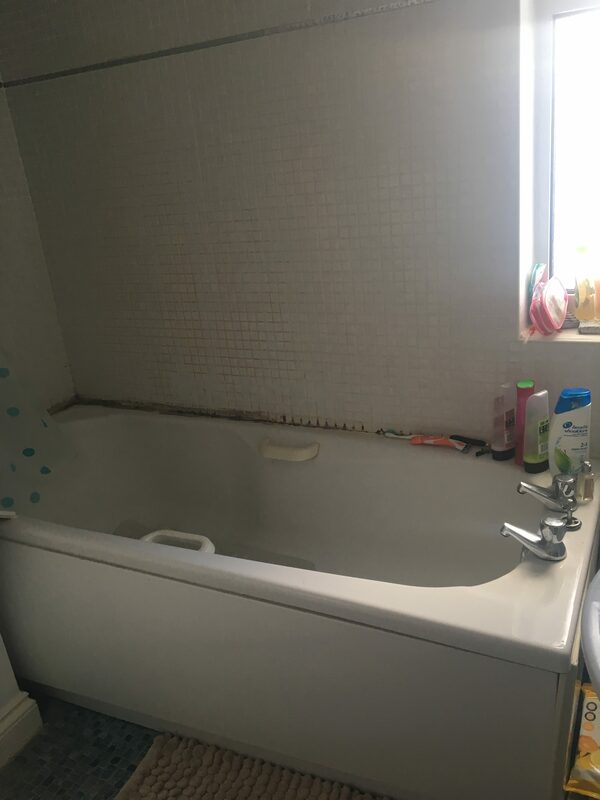 I am hoping this will not only make the bathroom a bit more water tight but will also making cleaning easier and should just make for a better experience overall. I’m aiming to do a post during the work if I can get good enough photos but if not I’ll update you when the work’s finished. Your home is a place that you should love to spend time in. You should always be happy to be within your home. And, you should enjoy the way it looks. Unfortunately, though, this isn’t the case for a lot of people. When it comes to interior design, even the small details are incredibly important. And, a lot of people neglect this. Once you’ve gotten used to the room, it can be hard to see where you’ve gone wrong. To help you out, this post will be going through some of the little areas that a lot of people struggle to consider for their home. So, now, you just have to get out and start making improvements. Your home is no doubt littered with small ornamental pieces which you barely ever consider. For example, most rooms will have some sort of lampshade. But, a lot of people opt for the cheapest or easiest options. Instead, you need to spend a long time on these parts of your home. 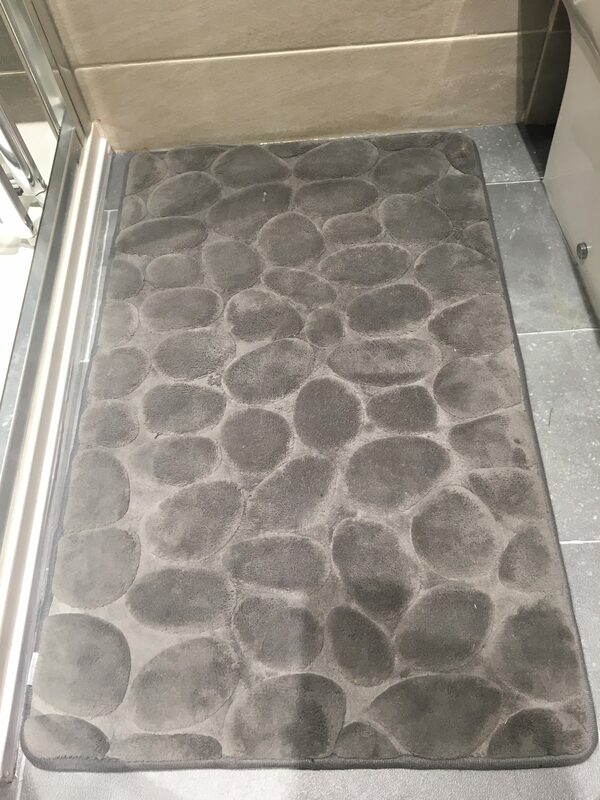 The little details like this will tie together the design you have for the rest of the space. Finding items to fill your space can be hard, though. So, you need some places to get inspiration. Instagram is the best social media platform for finding new design ideas. It allows you to search for things by tag; making it easier for you to find exactly what you like. Of course, ultimately, you will make the final choices. Just make sure they go well with the rest of the space. Next, it’s time to look a little deeper. Everyone knows how important colour can be to design. But, people seldom consider the important texture has. Texture will often define how an object looks and feels much more than it’s colour. So, it’s important to consider this with your items. There are a wide variety of options for kitchen tap finishes and other metals you’d find in your home. And, materials like wood provide loads of scope for great finishes. You may have to do some research to find exactly what you like. But, this area is very important to consider. If you don’t think about it; you could find that your rooms look a little cheap or gloomy. The final area this post will look at isn’t quite as a small or detailed as the others. But, lighting is still critical to a home. Unfortunately, a lot of people opt for a simple light in the middle of the ceiling. But, this looks boring and won’t do much for the rooms looks. Instead, it’s best to rely on a mix of lamps and ceiling lights throughout your home. Having different light sources throughout your home will give it a warm and rustic feel. 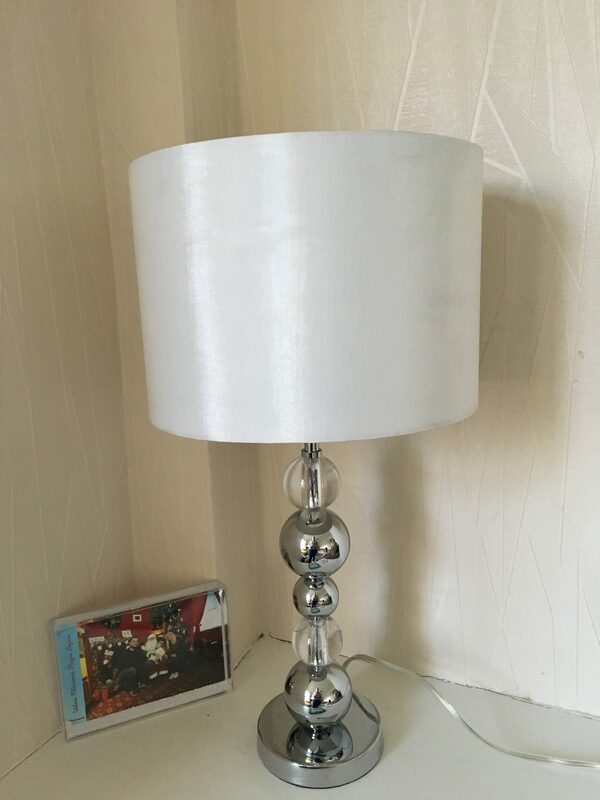 There are loads of different places that selling lighting products. And, smart lights are becoming all the rage. These sorts of lights allow you to control the colour and intensity of a light; while not even at home. Hopefully, this will inspire you to start working much harder on the rooms that you decorate. A lot of people ignore these areas. And, this will only result in feeling bad about the room in question. Once January is here, many of us are ready to turn over a new leaf and start some new chapters in our life. That’s not all, though; lots of people also plan on sprucing up their home and giving some of their rooms a nice makeover ready for the year ahead. And one of the most popular rooms that undergoes a makeover in January is the living room. As this is one of the most used rooms in any home, there is no wonder that homeowners want to make sure that there’s has the wow factor. But how exactly do you add the wow factor to your cosy living room? You just need to remember to add these stylish additions. If you want to really wow anyone who sees your new living room, you should think about adding a piece of statement furniture. What makes the item of furniture a statement? It should stand out from everything else in the room and be a real attention grabber. Most people go for a large sofa as their piece of statement furniture, such as a Chesterfield sofa. Alternatively, you may want to go for a chic oak coffee table that you could decorate with a statement centrepiece. Another great addition to any living room is a large mirror on an accent wall. 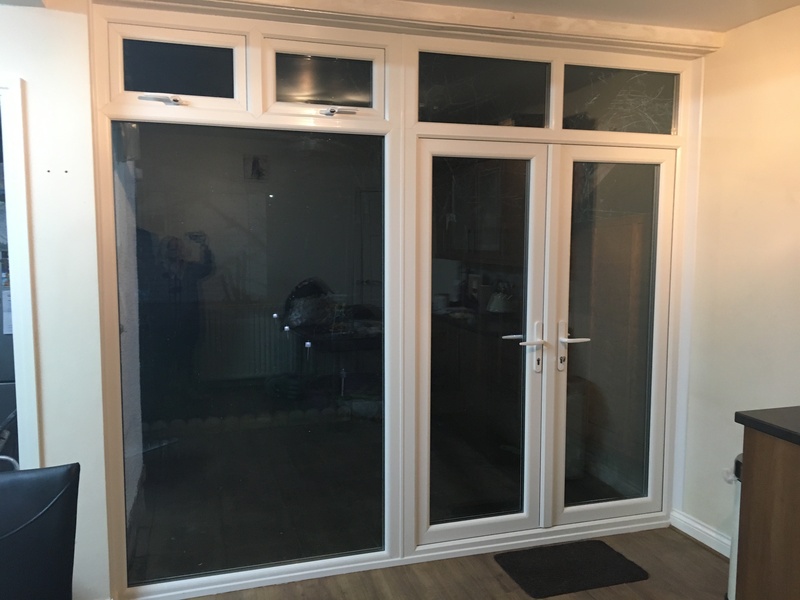 This will work very well in smaller living rooms as it can help to make them feel a lot bigger than what they actually are. If you want your mirror to stand out as much as possible, go for something very decadent, such as one with a gilded frame. However, if you would prefer a minimal decor, a gilded-framed mirror won’t match the discrete decor. In this case, it would be worth going for a simple metallic frame. Lights are one of the most practical parts of any living room. They are necessary to light up the room, and the right lighting can add a great illusion of space. But why just add the simplest of light fittings to your room when you could turn them into one of the room’s most decorative features? If you have some wall lights, make them look very pretty with some fancy sconce lighting fixtures. You could turn your room’s central light into a centrepiece by adding an elaborate shade. One great way to add some colour into your living room is to add plenty of fresh flowers and plants. Not only will they pop with colour, but they will also help to freshen up the air in your living room as well. You’ll find that adding some plants will be a great way to get rid of any musty smells that may be lingering! Don’t worry if you think you won’t be any good at keeping the plants alive; there are plenty of low-maintenance ones that are perfect for keeping in your home. Think about going for spider plants and English ivy. Kitchens are one of the most-used rooms in a home. We can spend hours in their cooking. And if you have your dining table in your kitchen, you will spend even more time in there! They are great places to socialise during parties and also become a hub of activity during dinner parties. So it is very important that your kitchen is both homely and practical. So how do you combine these two sides? Here are some helpful tips to getting it right. It is very important that your kitchen is hygienic so that it is the perfect environment for preparing food. Because of the importance of a clean kitchen, it can be very easy to design a very sterile kitchen. This isn’t too great for its homeliness! One of the best ways to get the best of both worlds is to use stylish materials such as granite and marble. Granite Worktops are easy to clean and will also look very chic. If your kitchen is quite cold, you can add personal touches to it to help brighten it up and also add your personality to its decor. This can be very easy to do. One of the quickest personal touches is sticking your young children’s art onto your refrigerator door. You can also add some family photos and postcards. If you have any other trinkets from trips abroad or that are related to your hobbies, try to incorporate them into your decor. This only really applies if you live in a very old home. One exciting way to revamp your kitchen can be to strip out all the current appliances and fittings. 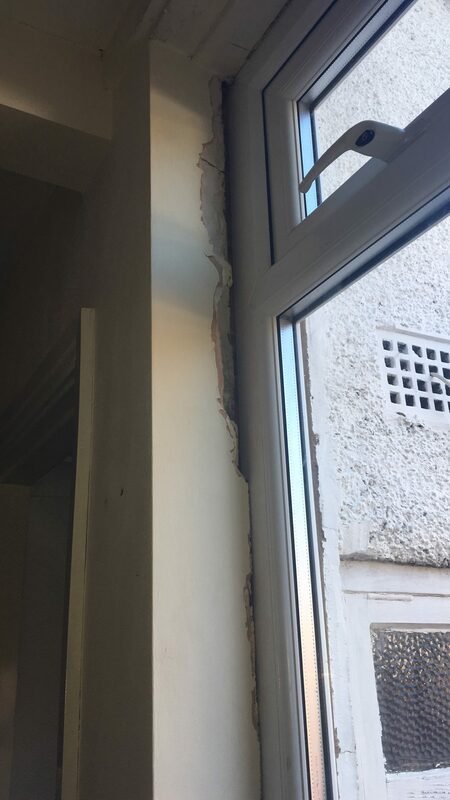 Then you can expose all of the property’s original features. Strip away the ceiling to expose any original wooden beams. 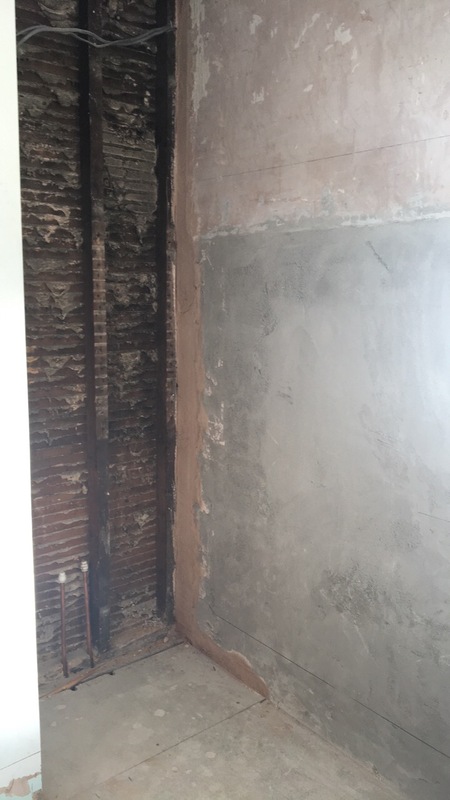 You can also strip off any plaster from the walls to expose the brickwork. This will look very stylish in old farm houses and cosy cottages. If you have enough space, add some comfy furniture to your kitchen. You shouldn’t just have a dining table and chairs as the only place to sit at. If you bring in some more armchairs, you can create a comfortable sitting area. By creating this seating area, you are giving yourself more reason to spend time in your kitchen and enjoy its surroundings. To really ramp up the comfort factor, bring in some coffee tables and foot stools as well. One of the benefits of relaxing in your kitchen means you won’t need to go far to make a cup of tea! 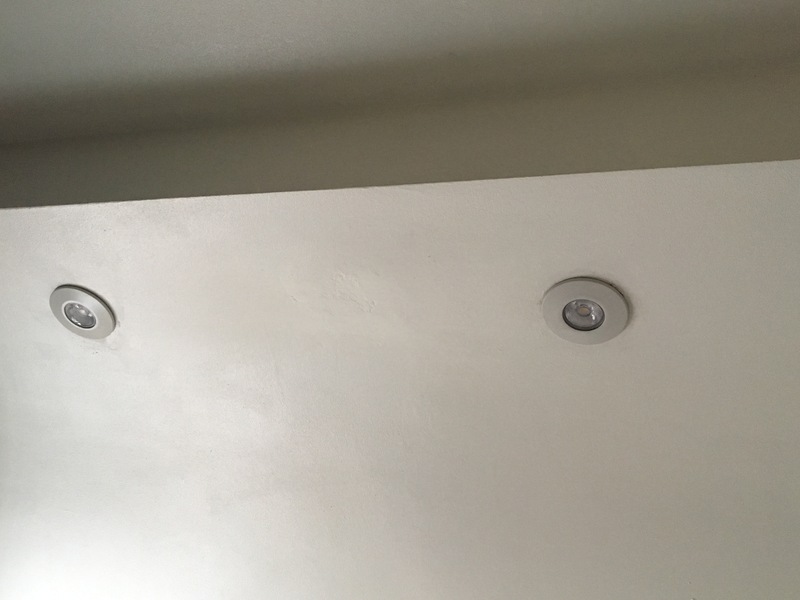 Add dimmer lights so you can alter your lighting depending on what you are doing. If you are preparing a meal, turn them up bright so you can see exactly what you are doing. If you are hosting a dinner party, dim them to create an intimate ambiance. So there you have it – a homely and practical kitchen that your whole family will love!